April | 2018 | Friendship! Effort! Victory! 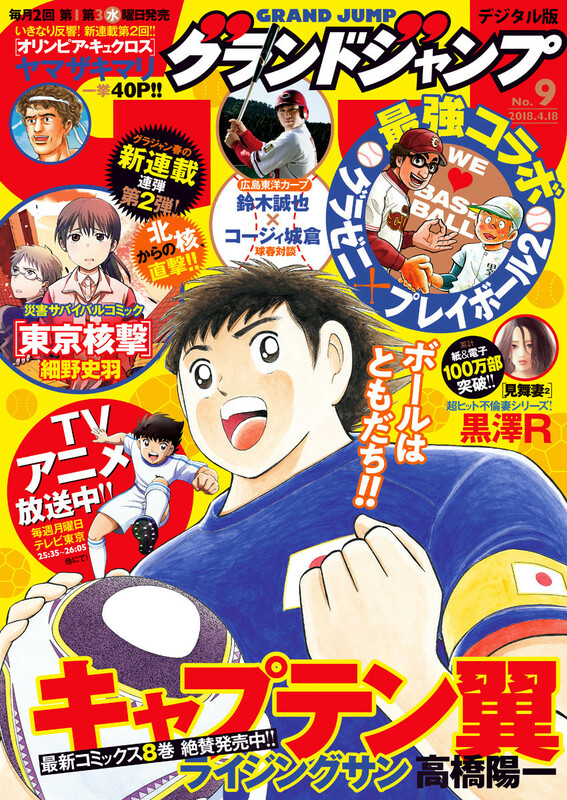 As of writing this piece, I’ve been reading Grand Jump for 15 issues, released twice a month since September last year, and it’s been an interesting journey compared to our last highlight for these, Weekly Shonen Sunday, being a magazine aimed at a much older audience; that of older Japanese businessmen (though as with all demographic stuff, this is largely an arbitrary designation). This means that the content is aimed at a much more mature audience, and presumably a more intelligent breed, doing away with the furigana (hiragana above kanji) that’s helped me keep my head juuuust about above water when reading, and as such I’m usually up s**t creek without a paddle reading this stuff. But I’m nothing if not stubborn, and equipped with both a decent ability to kind of work stuff out visually when my own brain and dictionary/vocab reference lets me down, and manage to read some eleven of the magazine’s twenty(ish) series on a regular basis, all of which I’m going to talk about at some short length below. The vast majority of these aren’t talked about in western comics circles, and so I really wanna shed light on what are some of my all-time favourite comics. Let’s go.